This is both a good and a bad thing. Good because now there are other ciders to try. Bad, because it means that while the overall stock of cider is up collectively, each blend is more limited. And so the need to be careful about spreading things too thinly becomes a factor to supply. This coming week, the three blends will start to be sold to the usual outlets - both in draught and bottle conditioned forms. It also is the week of the Southampton Beer Festival, which falls just as the cider reaches maturity properly. On the retail side, I hope to add one more to the mix which would mean that the bottles can be found in Fareham as well as Southampton and Gosport. Again, while an expression of interest has been made, I will have to feed back later this week on the outcome. Overall, the two main blends of Hampshire Heritage and Wild West cider should start to be seen in more places - just ever so slightly. A controlled expansion is always better than a quick one which leaves no more cider! OK, so not sufficient difference to worry about - even Eastern, which was some .6% out is OK legally... but it is nice to be able to put a proper and accurate figure to it. Moving on with the business, yesterday I sat the APLH - a qualification that is required in order to apply for a Personal Licence. I won't find out for a week or two whether I passed (I should hope I do though!! ), but it will mean I can start to do more retail sales without needing anyone elses permission or authority. So, as long as I don't get caught streaking in the meantime I ought to be a Personal Licence holder in a few weeks. These courses are run by CPL Training who run them all over the coumtry. You can find out more on the Cider Workshop website if you think its for you... but make sure you take your own coffee!! This weekend saw several cider making events around the UK. The annual Big Apple Blossomtime celebrations started with its usual cider trials at Putley village hall... a small venue for a much respected and popular event. Down south, the Powerstock festival in Dorset is a growing event which incorporates festivities with another peer judged competition. And the Reading Beer and Cider Festival, in its 17th year, held the National CAMRA Cider Competition finals AND the regional round of next years competiton. Clearly even cider makers are not magicians, so attending all three was a bit of a tall order! In any event, competitions for me are about making sure that the cider I made last year is of good order. So I entered the Putley trials which were, after all, responsible for my going commercial in the first place. 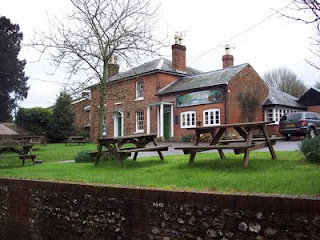 In addition as a supplier to the Reading Festival entered the Hampshire Heritage into the regional round of the CAMRA competition (though I couldn't attend as I was in Putley). Whilst it is a shame that all three events were held on the same day (definite case of bad timings!!!) the weekend was very good. Reading has been buzzing (so I have heard) and nearly run out of cider on several occasions. As I write this, I have yet to hear from anyone who attended the Powerstock festival - so they must have had a very good time indeed! As a friend and cider making compatriot (Mark Shirley) said, it has been a good weekend for cider and perry!